I began writing as part of my practice after Robert Lanza, M.D., the author of Biocentrism and Beyond Biocentrism, read some of my biomedical articles. He thought I might want to write a grand unified theory (GUT) of Zen. Feeling unqualified, I rejected the idea. However, Nyogen Roshi encouraged me to write about the intersection of Zen, science, and Mind. That effort became my website Zengut. Later, my son suggested that I write a book about Zen for kids. Once again I rejected the suggestion. Why bother kids with weird Zen stories? At best they would seem silly, at worst, boring. On the other hand, I thought it might be fun to write a fantasy adventure story for older kids, to push myself beyond my intellectual comfort zone. To write a book the 10-year-old me might have enjoyed, and still would! My first novel, Aidan and the Dragon Girl Save the World, was borne of my love of history and an interest in how dragons are viewed in the east—not as fire-breathing reptiles but as shape-shifting water spirits and protectors of the Dharma. The protagonist is an 11-year-old boy whose grandparents are dream detectives, solving mysteries through dream travel. Now I’ve written a second Aidan novel, inspired by my interest in early Buddhism and the cosmology of ancient Egypt. 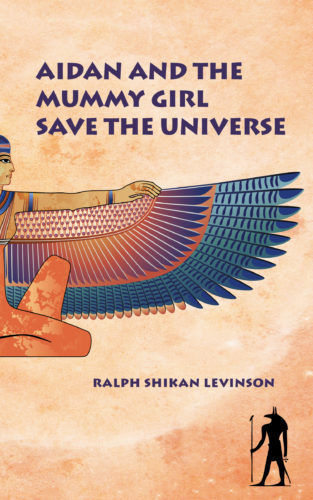 It’s called Aidan and the Mummy Girl Save the Universe. Although I wanted this book to be funny, I soon saw it wasn’t evolving that way. This is how writing fiction is a spiritual practice for me. It comes from a deeper place than my non-fiction writing—a place full of surprises and twists, with a life of its own. In this novel, Emperor Wu (China’s only woman Emperor) needs Aidan’s help again. He has to muster his courage and compassion to save the universe from the forces of chaos. This book is dedicated to those who try not to get trapped by their stories, a difficult practice indeed. In the following excerpt, Aidan is concerned that Emperor Wu may have imprisoned his grandmother, Jane Prosperowitz, the dream detective. The character Wise-and-Able is based on the Sixth Patriarch Hui Neng. Butterfly is Aidan’s Dharma name in old China. Aidan fell asleep and was face to face with Emperor Wu. She was sitting on her throne and did not look surprised to see him. They were alone. There weren’t even any guards. Aidan didn’t wait for Emperor Wu to speak. “Where’s my grandmother? I want to see her,” he demanded. “To speak in my presence without my permission is death,” Emperor Wu stated with an even tone. “You know I’m not supposed to tell you things from my time that you don’t know here in your time—” Aidan said. “And there is no superstition or foolish and dangerous beliefs where you come from? You control the storms? Your doctors heal all sickness? Your leaders bring prosperity, peace and justice to all? Do they even try?” Emperor Wu snorted. Aidan thought about the things his grandfather often raved about, how people couldn’t seem to fix even simple problems because they refused to see past their greed, their narrow views and fears, their hate and, yes, superstition. Emperor Wu pointed at Aidan, her long finger shaking with anger. Aidan wouldn’t have been a bit surprised if she turned into a tiger and pounced on him and tore him apart and ate him for a snack, or became a fire-breathing dragon and scorched him to a crisp. Aidan thought he should be scared, but he was still angry. Even so, he had to admit she wasn’t totally wrong. He bowed, and then stood up. Emperor Wu coldly nodded her acceptance of his bow and dismissed him with a sharp flick of her wrist. Aidan could have let it be, but he couldn’t resist getting in some last words. Aidan turned and stomped out of the room. Aidan’s dream shifted to a small Chinese village. He was walking with the teacher of the Way of Wisdom, Wise-and-Able. They passed some young children playing. They were dirty, with snot-caked faces. One had an eye that looked grey and lifeless. They wore clothing that was little more than torn, filthy rags. All the same, they laughed and ran and fell and cried, and seemed to be having a great time, like kids everywhere in every time do if you let them. The grown-ups were working hard in the nearby rice paddies. One called for water and the oldest boy in the group, who was maybe seven, brought him a bucket. “I understand that you stood up to Emperor Wu,” Wise-and-Able said while watching the children play. “These kids, the farmers, will I hurt them if I blow it? Will there be a horrible famine? Is that why I’m here with you?” Aidan asked. “You fear for them, or you worry that you will feel bad?” Wise-and-Able asked. Wise-and Able mimed an executioner slicing a sword at Aidan’s neck, and then burst out laughing. “Not funny! Too soon!” Aidan yelped as he jumped back from the imaginary sword.